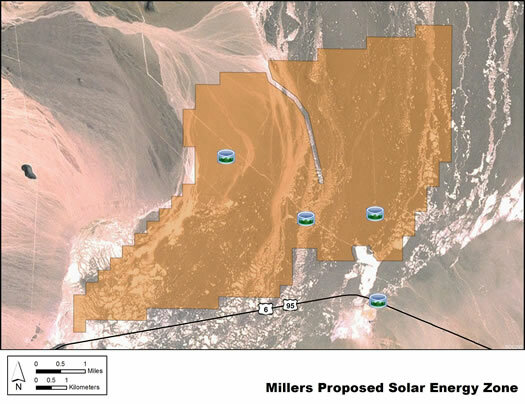 The Millers solar energy zone (SEZ) is located in Nevada in a semiarid basin with undeveloped scrubland. The SEZ is located on BLM-administered land within the Battle Mountain District. The Millers solar energy zone (SEZ) has a total area of 16,787 acres (68 km2). In the Supplement to the Draft Solar PEIS, 253 acres (1.0 km2) consisting of Ione Wash and a small wetland area in the southern portion of the SEZ were identified as non-development areas, leaving the SEZ with a potentially developable area of 16,534 acres (66.9 km2). No additional changes to the SEZ developable area were made in the Final Solar PEIS. The Millers SEZ is located in Esmeralda County in southern Nevada, 44 mi (71 km) east of the California border. The SEZ is located in Big Smoky Valley, lying between Lone Mountain to the south, Monte Cristo Range to the west, and San Antonio Mountains to the east. In 2008, the county population was 664, while adjacent Nye County to the west had a population of 44,175. The nearest town is Tonopah, Nevada, about 15 mi (24 km) to the west. Land within the Millers SEZ is undeveloped scrubland characteristic of a high-elevation, semiarid basin. Vegetation is generally sparse in much of the SEZ, with widely spaced low shrubs and much bare soil, particularly in the playas. The vegetation is predominantly greasewood-shadscale. A number of washes, including Ione Wash, cross the SEZ in a north-south direction. The Millers SEZ is undeveloped and rural, with few permanent residents in the area. Transmission lines, fences, and roads are present within the SEZ, and there is some evidence of off-highway vehicle use. Part of the SEZ is authorized by the BLM for grazing. The Millers rest stop and a communications tower are nearby on U.S. 6. Transmission towers and lines are found along U.S. 6 and also between the highway and the SEZ. The nearest major road access to the SEZ is via U.S. 95/U.S. 6, which runs along its southern border. A 120-kV transmission line passes through the SEZ. As of May 2012, there were no pending solar applications within the SEZ.